One of the most common issues raised by virtual teachers in Second Life (SL) is how to get new students up to speed with the fundamentals. You know – walk, talk, navigate – that stuff. For those with little or no experience in 3D environments it’s not easy to pick up SL’s basics, however these are the skills that underpin everything we do in world. Needless to say a solid set of foundation competencies is vital to the success of any learning endeavour. The problem is that eradicating SL newbie–ness takes time – many would argue lots of time. 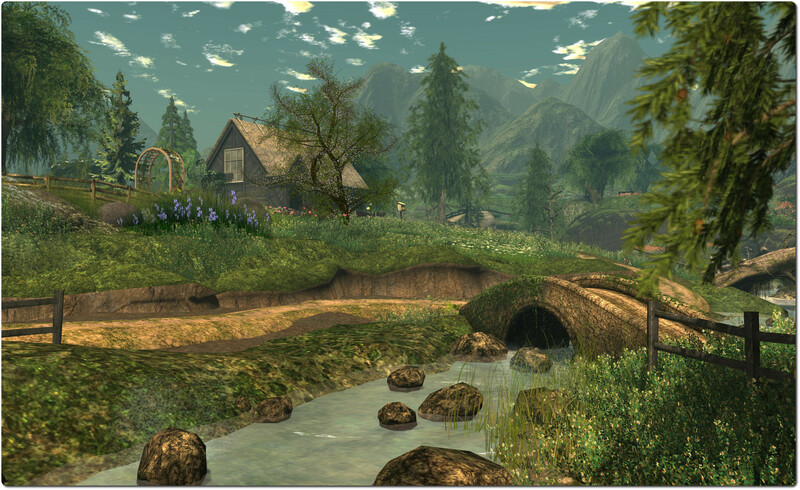 So opens a UWA blog post by Carmsie Melodie about a web-based resource she has put together which, while primarily aimed at the education sector, potentially has a broader reach when it comes to assisting those new to Second Life. The SLictionary, a searchable glossary of Second Life terms, words, abbreviations, etc. It is the SL Basics modules which are the focal-point for Carmsie’s blog post. In it, she covers the aims of the series, outlines the structure of the modules and their relationship with one another, etc, and provides notes and thoughts on how the series can be delivered (e.g. as a series of self-teach modules, as a classroom-lead activity, or as a combination of the two). While primarily aimed at educators and instructors, the introduction to the series notes it can be used by anyone new to SL, or who is interested in trying-out Second Life. 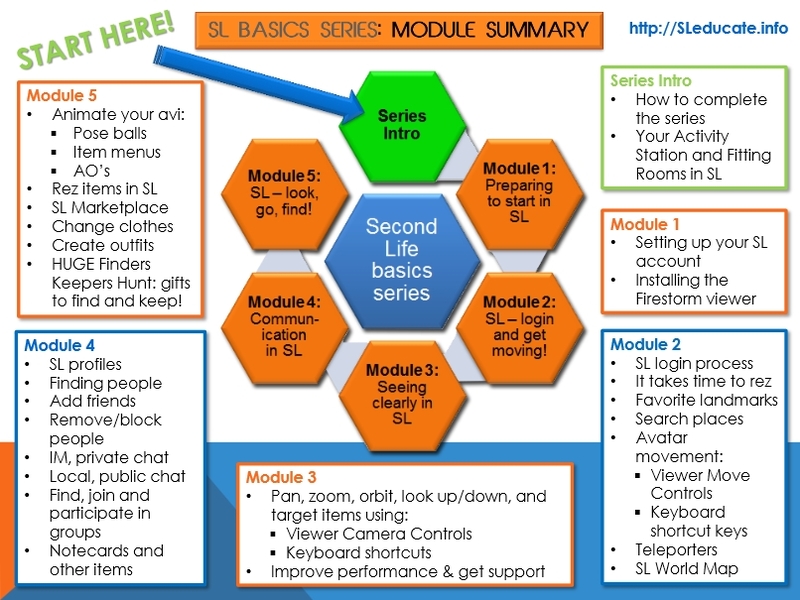 There are six modules in total – an introductory unit and five learning modules which take someone wishing to get started with Second Life from signing-up for an account, through downloading the viewer (Firestorm being the viewer of choice in the course), and on to the essentials of getting about in SL, and understanding camera controls, clothing, inventory, etc. Each module comprises one or more interactive Adobe Captivate sessions, complete with embedded video and demonstrations, with supporting information such as PDF format “cheat sheets” and other handy documents, useful URLS and SLurls, additional optional videos and demonstrations, etc. Each of the Adobe Captivate sessions in turn covers a specific aspect of using Second Life, and can be allowed to run at its own pace, or users can step forward / back through it as needed, with an estimated maximum duration for any session of around 15 minutes. To assist with using the modules for self-teaching or asynchronously, and to provide and in-world community around the SL Basics Series, Carmsie has created the SLeducate group in-world. This can be used by those following the modules to seek assistance, ask questions, exchange ideas, and so on. Magnum remained on the Experience Tools project, and receives the same updates as the Main channel, so LSL support for materials is now grid-wide. The LSL JSON bug fix, BUG-6466, just makes it so that numbers in the format “1.0e+2” get parsed as JSON numbers. Previously, they’d be treated as strings (though “1.0e2” would be treated as a number). The spec says that “+” is optional, so we added that support. I’d be surprised if more than 2 people end up noticing that change 🙂 . The one non-bug fix change in BS and LT is more verbose logging of certain L$ transaction types … Historically, a L$ transaction from scripted payment (llTransferLindenDollars or llGiveMoney ) would not include the name of the object that did the payment, when you viewed it in the “L$ Transactions” section of the website. However you would see that information if somebody had paid L$ into an object. Previously, the entry would just look like this: Destination: Maestro Linden; Object Pays; Region: Morris. But now, with the update to BS and LT, transactions in those regions will additionally include this line: Description: <Name of object which paid>. The page where you see the difference is https://accounts.secondlife.com/transaction_history/. Anyway, it could be useful for understanding which of your objects are paying out L$. Assuming they’re not all named “Object” :). Updates were out-of-order there. Basically if your script took things off on the region change, anyone might get the updates out-of-order. It was worst on slow connections. For those who are curious, it went like this: if the first update from the new region was slow, the “kill” message removing the object would happen first, and get ignored. In this case you can’t detach it … because for the sim, it’s already gone. The viewers are the ones out-of-sync with the server. So you right-click and detach again and nothing happens. The fix on BlueSteel and LeTigre should hopefully prevent this from occurring during a region change to regions on these channels. MAINT-3610 SL viewer partly ‘eats’ chat-message. Please refer to the release notes link above, for the full list of MAINT fixes. The Lab issued a new project viewer on Wednesday July 9th, version 3.7.12.291799, which contains a number of updates related to the third-libraries used by viewer. This viewer has grown out of Monty Linden’s ongoing HTTP work, which required the update of several essential libraries used by the viewer, and Monty took the opportunity to undertake a more extensive update of the libraries. These library updates should provide better security, stability and consistency improvements to the viewer. However, an advisory to Mac users warns that the updated libraries in the viewer have been built with a minimum OS level of 10.6. Therefore, this viewer, and future viewers based upon it, will not run on OS X 10.5. A few users have experienced problems with avatar appearance due to their very specific network configuration. Gray avatars are accompanied by ‘Transferred a partial file’ errors in the SecondLife.log file. Linden has not been able to reproduce this internally but a possible workaround is found in this release. A list of related JIRA reports is also given, but none of these appear to have been switched back to public access at the time of writing. They are: BUG-3323, BUG-3770, BUG-3877, BUG-3879, BUG-3882 and SH-4375. Users on the SL viewer using the AIS v3 viewer code are reporting issues with attachments when logging-in to Second Life. Some of the issues are described as a user logging-in to find their hair or (mesh) foot / hand or other attachment incorrectly positioned, and the only way to rectify the situation is to re-log. Some have suggested that swapping between a non-AIS v3 viewer and the AIS v3-enabled viewer may trigger the situation. One way to get a grapple on that sort of thing is to start a test run and keep track of the login times and regions. When you hit a fail, logout and do one more and see if it succeeds. If you provide that and the viewer logs, it would be easier for someone to do some log diving to figure out what the problem is. Maestro Linden is taking a three-week vacation from the Lab and Second Life. In his absence, Coyot Linden will be occupying the driving seat for the Thursday Server Beta meeting.